Make this cozy three bedroom cabin with optional 24 foot Sun Cruiser pontoon your Northern Minnesota getaway. Enjoy nearly an acre of private and pristine lakeshore with your friends and family.The cabin is located on a very private lot on Marion Lake in Otter Tail County near Perham, Detroit Lakes and Pelican Rapids. Marion Lake is a quiet, clean, peaceful, calm, 1660 acres spring fed lake and has excellent large mouth bass, walleye, pike, crappie, and pan fish fishing. The cabin has very recently been updated with all new flooring, new appliances, new cupboards, and a complete bathroom remodel. It has an open floor plan with three bedrooms maximizing every inch of floor space. It is 65 feet from the lake facing East for spectacular sun rise viewing out the front sliding doors and plenty of sunshine during the day. There are also multiple spots to pitch a tent for those who like to rough it. There is a ton to do and see in the area. Perham is a thriving town home to Barrel of Fun Potato Chips, Tuffy's Dog Food, and the International Turtle races held every Wednesday. There are excellent golf courses in the area and state parks to visit as well. This is our second summer on VRBO, and we eager to book more responsible guests and families in 2018. Our family lived at this cabin for the last year and we loved it! It has a very cozy and homey feel to it. It is clean, free of rodents (please help to keep it this way), and efficient. We have the internet, a roku for Netflix, and a DVD player. We do not have cable TV, but we do usually get two TV channels from the antennae. If you would like to rent a pontoon or a fishing boat, we can make arrangements for this at a reasonable price. Thank you for considering this cabin home and we hope you will be our guest. I was disappointed with the Cozy Cabin. It was so cold in the cabin, with just one small heater, that we went to Perham and purchased a space heater. This is the perfect spot for a relaxing getaway. The cabin was clean, comfortable and fit our needs well. The lake was beautiful with clear water, and a shoreline that was just right for us to put in our kayaks. We also thoroughly enjoyed taking the pontoon out for a little fishing, loon watching and just floating. Fishing from the dock was a lot of fun too. We caught some decent-sized fish there. The owners of the Cozy Cove Resort were great to us and we really appreciated having them just down the road. All in all, it was a great place, and we would definitely consider staying there again. Location was great, everything we needed it to be, we had a wonderful time and caught lots of fish! Was very beautiful and it was a extremely easy process. Booked pretty last minute and everything was ready and extremely clean! We rented the pontoon and had a blast!! Great owners to work with!! Can’t express enough how nice the whole experience was!! Cabin is old as he said, windows would hardly open, a very poor job of remodeling still not finished, Note on sliding glass doors not to use. Listed microwave, toaster...nowhere to be found. WiFi was not functional. No communication as to how to get in the locked cabin....Keypad in the listing...No keypad, had to search to find a hidden key to the door. Broken chair in living room tipped over when sitting in it. Very dirty dining chair cushions. Clean kitchen and bathroom, new appliances. Pontoon in very poor shape...all seats ripped from wear and tear. Rented the pontoon used for only 30 minutes, asked for a partial refund.....no refund received. The lake was really nice, good fishing standing on shore. Very nice neighbors to the south. Hi Jan, we are sorry to read about your disappointment as we are more accustomed to receiving positive reviews from our guests. 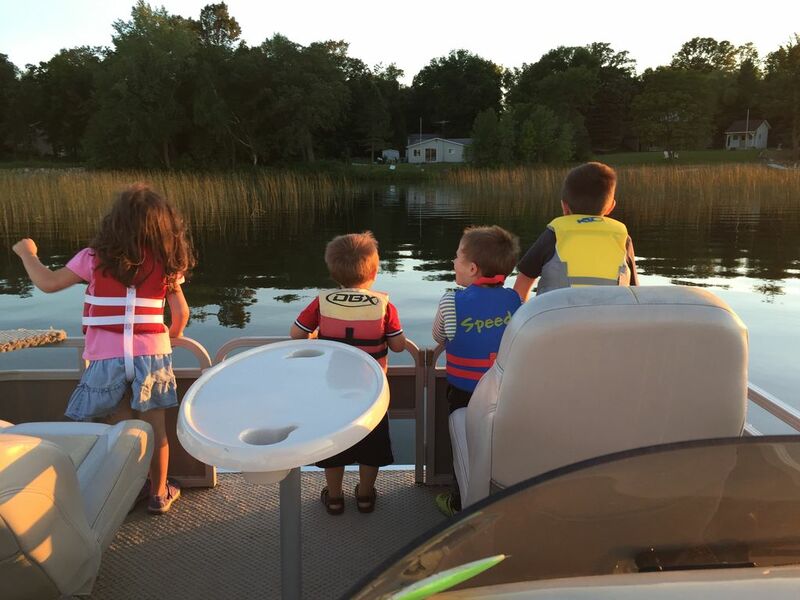 Our pontoon rental policy is the same as what you would find when renting a car, tools, etc. We charge by the day. We do not offer post-rental refunds based on time used because there is no way we can track that and also because we can rent out the pontoon to someone else on the lake if our guests choose to not rent it. Finally, sure, the cushions in the pontoon are a little worn out, but the pontoon motor is very reliable as is the craft itself. We have had many great times on that boat and this is our first complaint regarding it. In regards to your other concerns, we feel like you may have an axe to grind because we did not agree to your demands for the pontoon refund after your trip was already over. Had you voiced your concerns with the pontoon right away during your stay, we would have refunded your pontoon rental fee without question. Instead, you waited until the your stay was complete. That being said, thank you for bringing our attention to the chair and some of the other items. The chair has now been fixed. Also, we have a microwave and a toaster back in the cabin. We did not have them there for your stay due to logistical reasons that were not intentional, but they are now there. We have been having issues with our web connection and Arvig. Until it is resolved, I will be taking internet off of our listing. We are sorry for these inconveniences. Finally, we take great pride in keeping our cabin home extremely clean and functional for our guests. We are not the Grandview Lodge, nor are we priced that way, but we believe our cabin is a very nice place to stay. If you visit other area cabins and resorts, you will find the cleanliness, amenities, privacy, lake access and more far exceeds our competition at comparable rates. Thank you again for your stay and feedback. It was perfect for our girls get a way! It was a perfect little slice of heaven!! Girls weekend was awesome!! The cabin was clean, and had what we needed! The use of the pontoon was greatly appreciated! Floating is all we really wanted to do, and we achieved that!! Sun and fun!! The resort next door was super friendly, and accommodating when we needed gas for the pontoon. The only complaint is that the WiFi never worked for us. Other then that, we will be back!! Enjoy!! And the area was easy to navigate and enjoy the surroundings. Thanks so much!! Have a gread time!! Tony has a great place for you to use! !